This blog is one of a 5-part series covering key topics of discussion during Kerry’s recent Scientific Advisory Council meeting in Beloit, USA. At the meeting, our Scientific Advisory Council and Kerry colleagues from around the world came together to discuss pressing issues in nutritional science and how these issues can be addressed through research and innovations in product development. Each blog was written by subject matter experts who attended the meeting. Why Don’t Athletes in the Olympic Village Shake Hands? Empty calories, such as added sugars, have been the focus of increasing attention in dietary guidelines in recent years due to their association with poor dietary quality and negative health outcomes. Often accompanying dietary guidance are changes in policy that can impact the way food companies formulate their products or label food packages. In May 2016, the United States Food and Drug Administration (USFDA) finalised requirements for the new Nutrition Facts Panel for packaged foods and specified that added sugars must be included in the nutrition panel on food packages, expressed in grams and as percent Daily Value (USFDA, 2016). Furthermore, several countries either have already introduced or are in the process of introducing some form of sugar tax, although there is no conclusive evidence showing that such a policy can improve dietary behaviour. The update to the Nutrition Facts Panel brings several changes to what must be labelled on a food package. For more details, check out our article FDA Modernizes Nutrition Facts Label for Packaged Foods. These regulations have generated a lot of debate among the scientific community as to whether a reduction in added sugar intake would improve the health status of the population. However, with added sugar firmly in the crosshairs of public health policy, the food industry is left to define the added sugar content of their products, leading to the question – what are added sugars? Although there is no clear-cut definition for the term ‘added sugars’ or a standardized analytical method to quantify added sugar content of a food, the US Dietary Guidelines Advisory Committee (DGAC) described added sugars as “sugars that are either added during the processing of foods, or are packaged as such, and include sugars (free, mono- and disaccharides), syrups, naturally occurring sugars that are isolated from a whole food and concentrated so that sugar s the primary component (e.g., fruit juice concentrates), and other caloric sweeteners” (USDA, 2015 & 2016). Examples of added sugars can be seen in Table 1. Added sugars can be found in many types of food and beverages such as soft drinks, breads, cakes, jams, chocolates, and ice cream, as well as sugars eaten separately or added to foods at the table. It’s important to note that added sugars do not include sugars naturally present in foods such as lactose in milk or fructose in fruit. However, naturally occurring sugars such as lactose are classified as added sugars if they are used as an added ingredient during food production. For example, the sugar in 100% fruit juice would not be considered added sugar when consumed as a juice. However, if the juice were added to another product to provide sweetness, the sugar from the juice would then be considered added sugar. The confusion around what ingredients are considered added sugar is compounded by the fact that the “added” component is a value that must be calculated rather than something that can be directly measured in a product. Complying with added sugar labelling will prove a challenging task for the food industry in the coming months and years. For the first time ever, the US DGAC has provided a quantitative number for the reduction of added sugars in the diet. They recommend that individuals should limit their calorie intake from added sugars to less than 10% of total calorie intake on a daily basis (USDA, 2015), which is in agreement with guidelines from the World Health Organisation (WHO, 2015). In terms of grams, an individual who has a total daily energy intake of 2000 kcal should get no more than 200 kcal (50 grams) from added sugars. To put this in perspective, one can of cola contains around 40 grams of added sugar. This means that complying with these added sugar policies could also be a great challenge for the consumer! Current daily consumption of added sugars is on average 13% of total energy intake among adults and 16% among children (Ervin & Ogden 2013; Erickson & Slavin 2015). The major dietary sources of added sugars are beverages (47%) as well as snacks and sweets (31%) (Figure 1, USDA 2015). Within beverages, soft drinks were the highest contributor (25%). Within snacks and sweets, the main food sources of added sugar were dairy desserts, grain-based desserts, candies, sugars, jams, syrups, and sweet toppings. Figure 1. 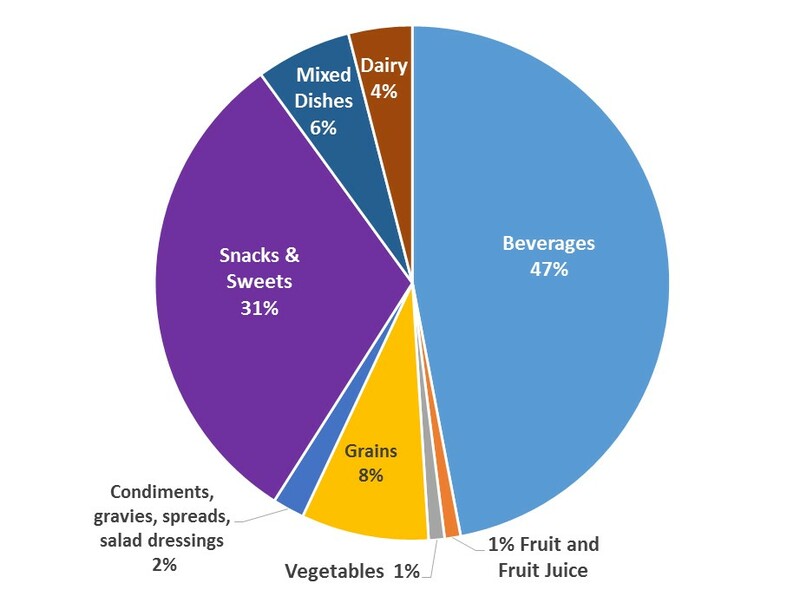 Food Sources of Added Sugars in the US Diet (USDA, 2012). The 2015-2020 Dietary Guidelines for Americans states that consuming limited amounts of added sugars in products such as wholegrain breakfast cereals or fat-free yogurt is acceptable as long as the threshold of 10% total daily energy intake is not exceeded (USDHHS & USDA, 2015). Since 78% of added sugars in the diet come from beverages, snacks and sweets, recommendations focus on changing how often these products are consumed as well as on how they are produced. Dietary Guidelines for Americans suggest consumers should choose beverages with no/low added sugars, reduce portion sizes of sugar-sweetened beverages, and limit how often such beverages are consumed. Additional advice includes limiting or decreasing portion sizes of grain-based and dairy desserts and sweet snacks, choosing unsweetened/no-added-sugar versions of canned fruit and yogurt (USDA, 2015). See our Sources for National and Regional Dietary Guidelines for added sugar recommendations by region. Added sugars not only contribute to flavour but also to food preservation and functional attributes including texture enhancement, viscosity, and improved appearance (Erickson & Slavin, 2015). Therefore, removing or reducing added sugars will have a significant impact on food production and presents a major challenge to food manufacturers. Taste is the key factor for the purchase and re-purchasing of food products by consumers, so even if manufacturers are able to successfully reduce sugar content, the final product must still taste good. Successful alternatives to added sugars in food products would not only be highly desirable to consumers but would also encourage reduced added sugar intake. A major limitation is that low calorie sweeteners are not considered an appropriate alternative to added sugars in foods and beverages by the DGAC due to uncertainty surrounding their long-term effects (Erickson & Slavin, 2015). One successful method for reducing sugars without affecting taste is the application of flavor modulation tools. These technologies can enhance our sensory perception of flavors like sweetness without requiring more sugar to be added to a product. By using this technique, overall taste perception and flavor profiles are improved, thereby producing healthier products, while maintaining consumer preferred taste. The USFDA ruling on the new Nutrition Facts Panel has two deadlines of compliance for manufacturers: July 26, 2018 for food manufacturers with annual sales greater than $10 million and July 26, 2019 for manufacturers who have less than $10 million in annual sales (USFDA, 2016). Aisling Aherne, PhD, RNutr graduated with BSc and PhD degrees in Nutrition from University College Cork (UCC). Following her time at UCC, Aisling spent two years working as the Healthcare Professionals’ Communications Manager with The Sugar Bureau trade association in London. In 2005, Aisling returned to a senior nutrition research position at UCC where she supervised a research team who assessed the biological activity of various naturally-sourced compounds, extracts, and foods. Since 2010, Aisling has held a number of commercial and nutrition manager roles in industry and recently joined Kerry as a Nutrition Manager. Ervin RB, Ogden CL (2013) Consumption of added sugars among US adults, 20015-2010. NCHS Data Brief 122, 1. Erickson J, Slavin J (2015) Are restrictive guidelines for added sugars science based? Nutrition J 14, 124. US Department of Agriculture (2012) Agricultural Research Service. Nutrient Intakes from Food: Mean Amounts Consumed per Individual, by Gender and Age, What We Eat in America NHANES 2009-2010. US Department of Agriculture (2015) Scientific Report of the 2015 Dietary Guidelines Advisory Committee. US Department of Health & Human Services and US Department of Agriculture (2015) 2015 – 2020 Dietary Guidelines for Americans. 8th Edition. US Food and Drug Administration (2016) Changes to the Nutrition Facts Label.